August 19, 1986, LG Crabo. 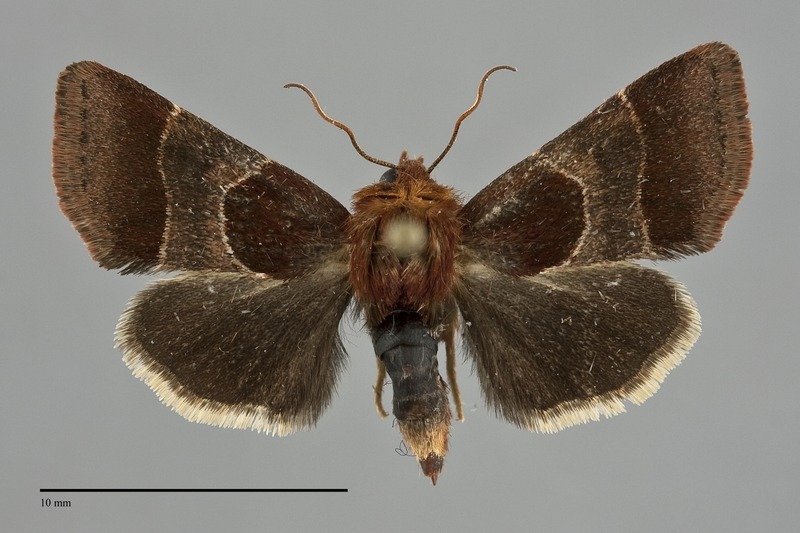 Schinia arcigera is a small (FW length 10 - 11 mm) velvety dark brown moth with smooth forewing lines and a yellow and black or all black hindwing that flies in southern Idaho during the summer. The base of the wing medial to the antemedial line is velvety chocolate brown to red-brown. The wing distal to the postmedial line is slightly lighter and usually grayer with a slight purplish tint. The median area is lighter purplish brown, darkest laterally due to a diffuse median line. The antemedial and postmedial lines are gray, double and filled with light gray to light tan. The antemedial line is smoothly curved toward the outer margin, nearly completing a half circle. The postmedial line is weakly S-shaped, convex lateral on the anterior wing and concave toward the base on the posterior half. The basal and subterminal lines are absent. 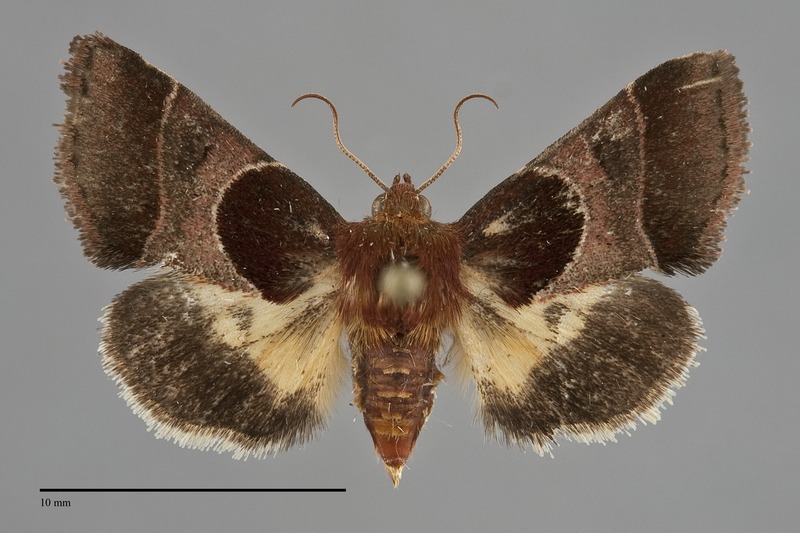 The fringe and terminal wing are concolorous. The hindwing color is sexually dimorphic. The ground color in males is yellow and that of the female is entirely dark gray to black. Males have a small gray discal spot and a wide sharply-defined solidly dark gray to black marginal band.The hindwing fringe is white with a dark gray base. The head and thorax are maroon. The male antenna is filiform. This species can be identified by the velvety brown wing base with a semicircular lateral border in combination with a yellow and black or black hindwing. The most similar species in Idaho is Schinia mortua. 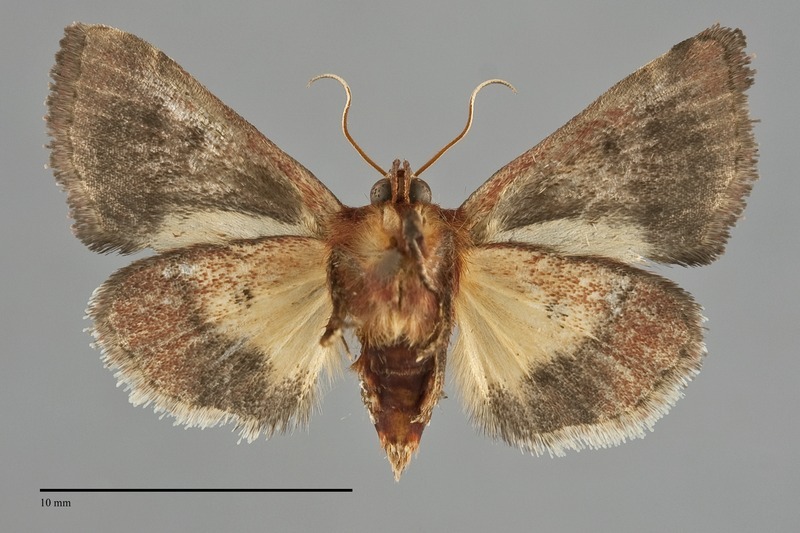 It has a more irregular-shaped antemedial line than S. arcigera, a dark reniform spot, and a light orange hindwing with a black discal spot. This species is geographically variable. 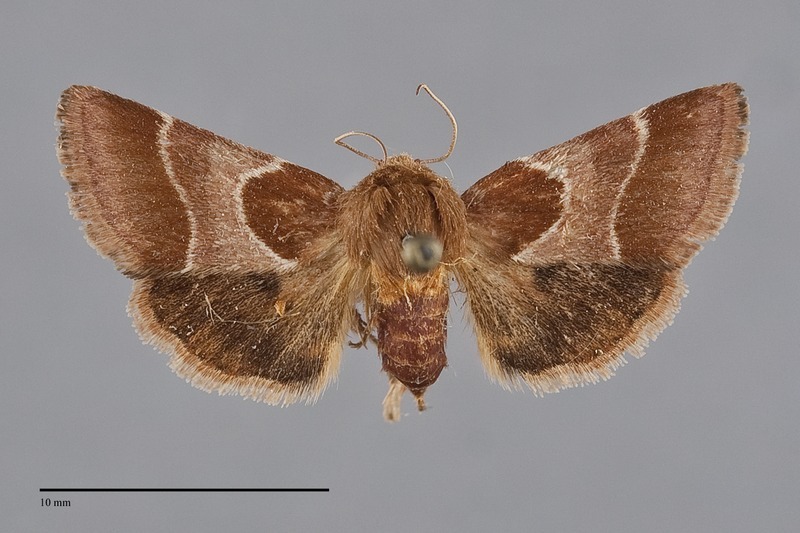 Western North American populations are lighter red-brown with lighter hindwings than those from the East. The name ferricasta Smith is available for use as a subspecies. This species is widely distributed thoughout much of North America in open forests, meadows, and prairies. The habitat in Idaho is unknown. Schinia arcigera has been collected on the Snake River Plain of southern Idaho in the Northwest. 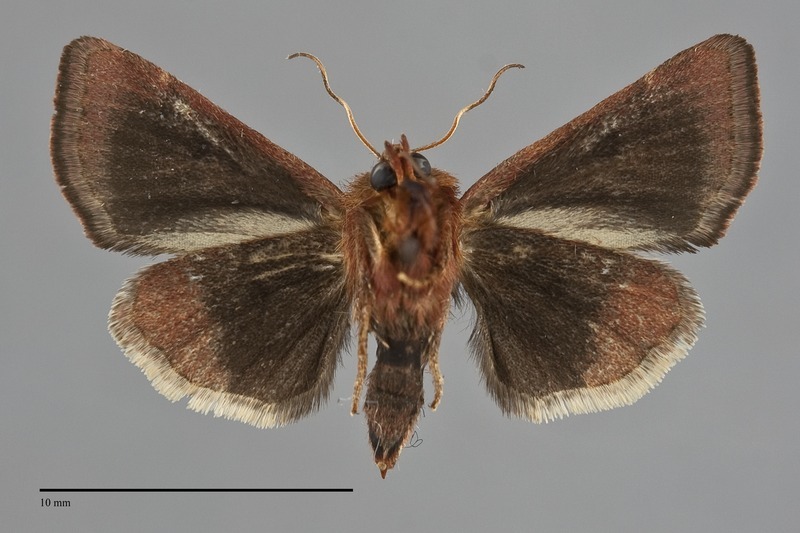 This species is widely distributed in eastern North America where it occurs from southern Canada to the Gulf Coast. The range extends west across the Great Plains to Utah and Arizona south of the Northwest region. This species is a foodplant specialist feeding on asters (Aster spp.) in the Asteraceae. It also feeds on Machaeranthera tenuis (Asteraceae) in Texas. 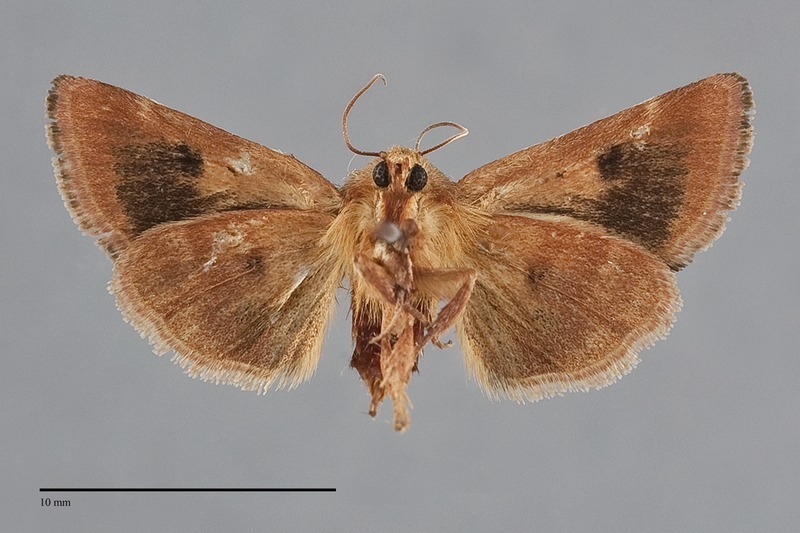 This species flies in the fall across most of its range. It has been collected slightly earlier during late summer in the Northwest, with records from mid-July through August. It is nocturnal and comes to lights.